First I've completed the Scotland Summer 2006 travelogue, which included a visit to Islay. And the last page happens to be a Departure from Islay page. The panorama above is small preview of the 180° Quicktime VR panorama of Gigha, Islay and Jura seen from the ferry included in the page. Worth a look I think. With that out of the way it was straight to the next travelogue, the Islay Walking Week 2007 travelogue. Not that much to see yet, but I hope to change that soon. 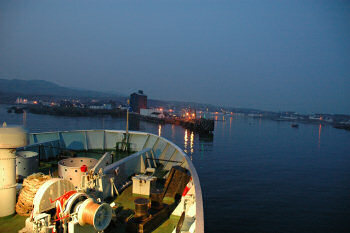 Right now I working on the Arrival on Islay page, as of writing this I'm still on the ferry. I had hoped to take a few nice pictures of the distilleries in the evening sun, but the weather had different plans. You'll see what happened on the travelogue. Hopefully more soon, but also expect some ‘normal blogging’ over the next few days. I've got a few links I'd like to share with you.